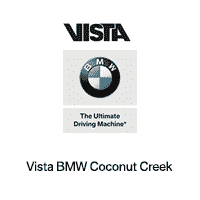 Vista BMW Coconut Creek Is An Independent, Family Owned And Operated Business. Despite Our Size And Sales Volume, We Have Never Forgotten From Where We Came And How We Got To Where We Are Today. We Are A Customer Service Business Through And Through. From The Moment You Step Foot Into A Vista Motors Sales Showroom Or Service Drive, You Can Expect Full Attention To Your Customer Service Needs.